Controversial Nigerian recording artist Burna Boy is embroiled in a legal battle in New York courts over his alleged breach of a live performance agreement entered into with Vibesland Entertainment LLC, a company owned by Nigerian-American promoter Niyi Fatogun, for a U.S. tour. 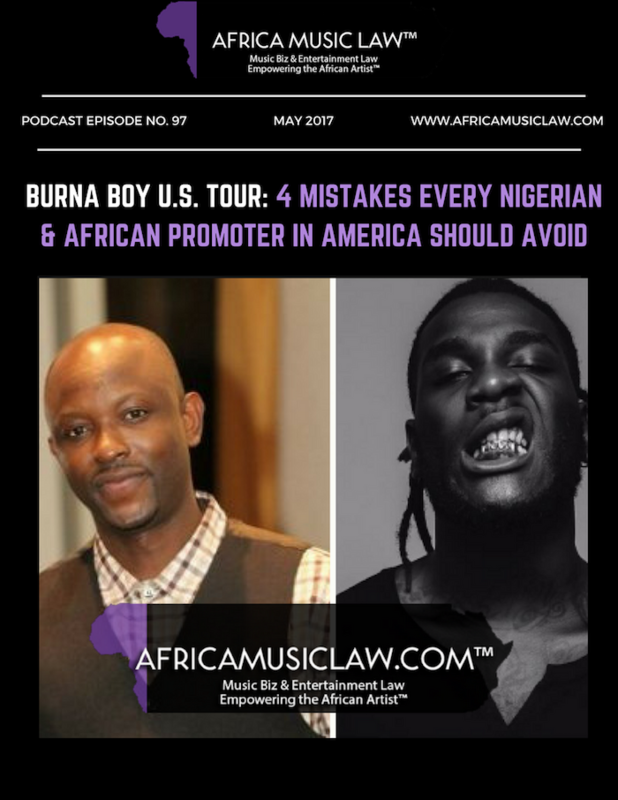 On the 97th episode of The Africa Music Law show, Ms. Uduak, host of the show, takes a look at the allegations and shares the 4 mistakes Nigerian and African promoters should avoid so they don’t end up in a similar legal battle. Uduak Oduok, the founder of Africa Music Law, is a Partner and Co-Founder of Ebitu Law Group, P.C. where she handles her firm’s intellectual property law, media, business, fashion, and entertainment law practice areas. For over fifteen years, as an attorney, she has litigated a wide variety of cases in California courts. She has also handled a variety of entertainment deals for clients in the USA, Africa and Asia including network television and licensing deals. Her work and contributions to the creative industry have been recognized by numerous organizations including the National Bar Association and featured in prestigious legal publications in the USA: ABA Journal and The California Lawyer Magazine. She can be reached via email (uduak@ebitulawgrp.com) or on twitter: @uduaklaw. Hosted by California-based Fashion & Entertainment Lawyer Uduak Oduok (Ms. Uduak), The Africa Music Law show is a show empowering the African artist through brilliant music business and entertainment law commentary and analysis, industry news, and exclusive interviews. The show has been downloaded over 200,000 times and made iTunes top 4 ‘New & Noteworthy.’ Subscribers include Africa & Hollywood’s power executives, investors, lawyers, artists and other industry stakeholders. The blog itself has been cited in a U.S. top-ranked law school’s ‘International Law Review’ journal. Country demographic: Nigeria (26%), USA (23%), UK (15%), UAE (7%), and Other (29%).